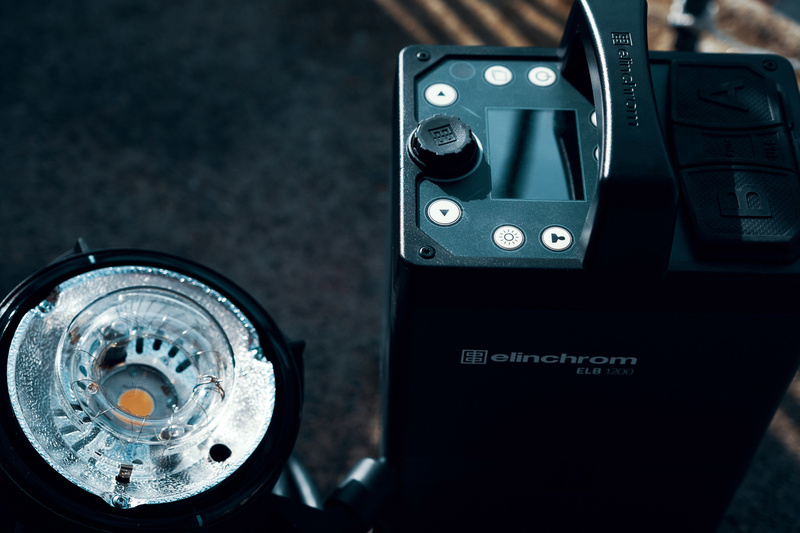 The Elinchrom ELB 1200 is the almost perfect battery pack for any photographer who shoots with flash. Powerful but not too cumbersome to carry, it has a lot of features to seduce you! Find out through this review if it has a place in your kit or not. The Swiss flash manufacturer announced last year the long overdue successor to the Ranger RX, and it’s called the ELB 1200. While it follows the idea of its predecessor, it’s been entirely redesigned to match the more modern features of current Elinchrom strobes and also to offer photographers a lighter 1200 Ws battery-powered flash. I’ve had the chance to play with a kit for a little while now, and I thought I’d tell you all about it: the good, the bad, and even the ugly. 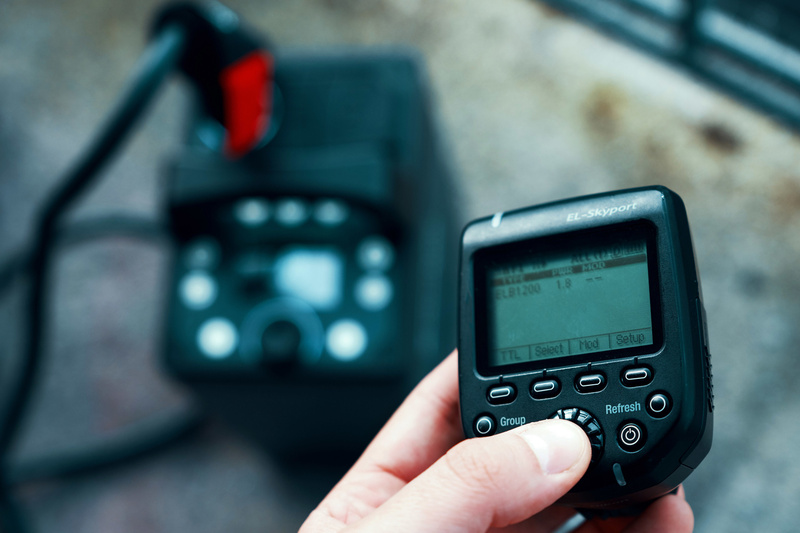 The ELB 1200 is a battery-powered flash with a battery pack and a flash head. It weighs around 9.4 lbs, which is about half the weight of the Ranger RX and around one third lighter than the Broncolor Move L, making it the lightest 1200 Ws battery flash system to my knowledge. Don’t take the weight as a sign of poor build quality, because it’s not. Elinchrom designed it to be their flagship strobe for outdoor and action photography and it shows. I’ve been carrying it from location to location for a couple of months, and it still looks and works like a brand new unit. The battery has a double lock system, preventing it from falling. One charge will yield around 210 full-power flashes and almost double with the bigger HD battery. The reason for the two battery sizes is just because of the current flight regulations. The standard, or Air battery, can be taken as a carry-on, while the HD battery will have to be placed in your checked-in luggage. 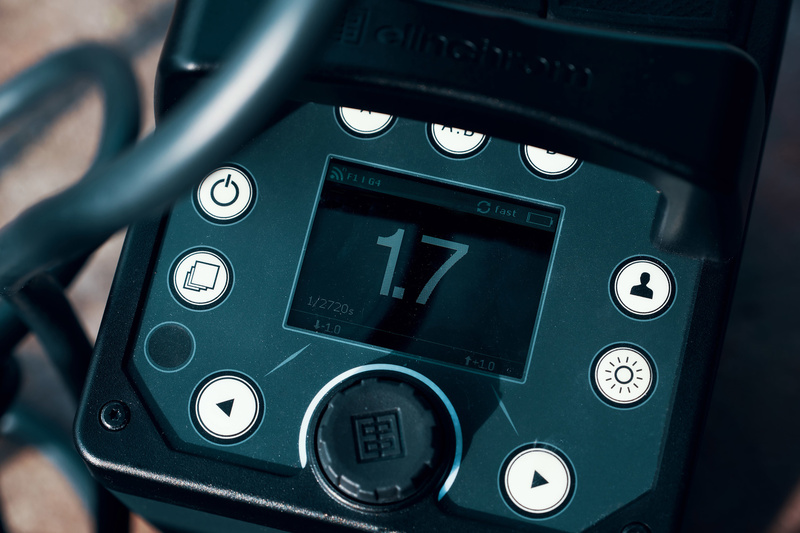 The user interface of the pack is very similar to that of the Elinchrom ELC HD and ELB 500 units. 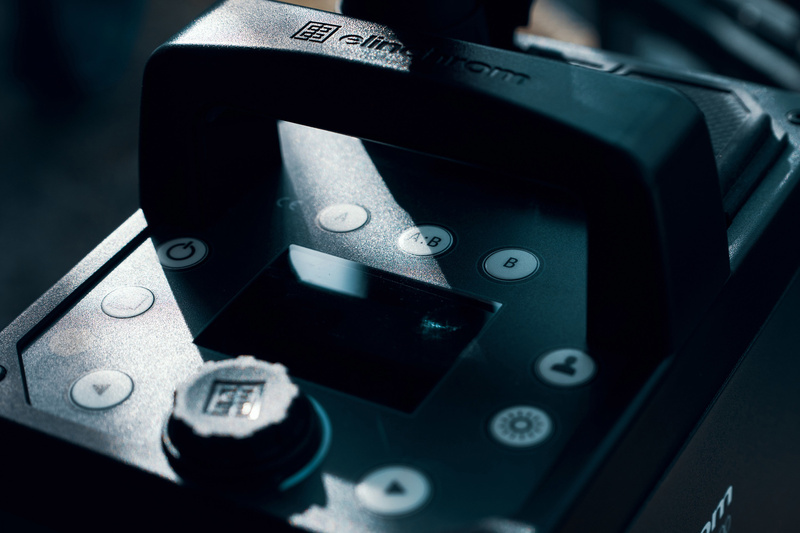 It’s not as easy as a Profoto to use and navigate, but it doesn’t require a Ph.D. either. The pack is compatible with both the Skyport Universal and HS Plus for wireless triggering. The heads are also much better than the ones of the Ranger RX. They feel solid like their predecessors and rely on a dimmable LED for the modeling lamp, a 250 W Halogen equivalent with a CRI rating of 92. 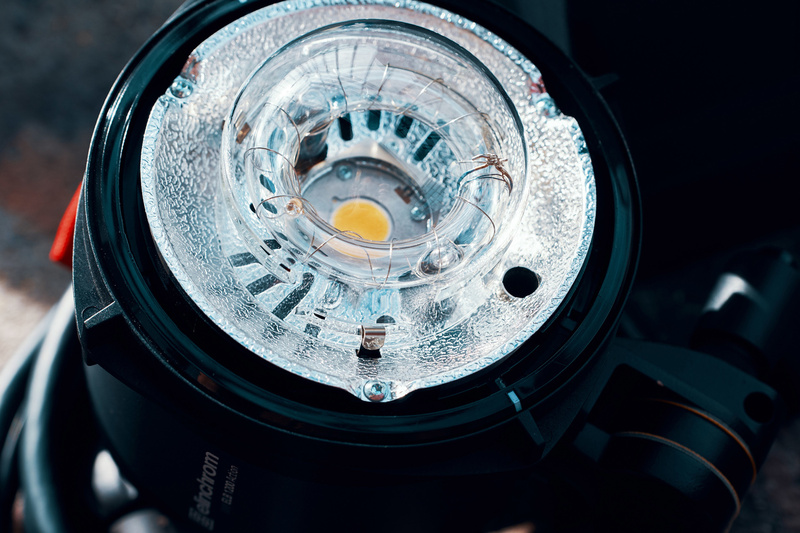 Like the Elinchrom LC HD or Broncolor Siros L, the tube and LED are protected by a glass dome. As I wrote in my ELC HD review a couple of years ago, it doesn’t inspire much confidence in terms of robustness. It’s the only part of the head and pack that doesn’t feel very solid. But, I was told by Elinchrom that it is now mandatory to put a protection around the tube/LED, and thus they don’t have a choice but to use either this kind of glass dome or a recessed tube like Profoto did with their recent compact and battery-powered units. I personally prefer having a non-recessed tube with a glass dome like Elinchrom and Broncolor did rather than having to deal with a recessed tube. The Elinchrom system up until the ELB 500 TTL has been known for relying on HS to allow users to go above flash sync speed. The ELB 1200 is no exception, and thus you’ll have the choice between three different heads. All similar in conception, they differ in their usage. The Action head offers the shortest flash duration possible across the whole power range, the HS is best for Hi-Sync, and the Pro is in between the two. The Pro is my personal favorite as it still lets you get decent results in Hi-Sync (shutter speeds close to leaf shutter lenses) while giving you short enough flash duration for most subjects that aren’t moving too quickly. In terms of design, while I like the look of the unit, the button placement felt awkward. Three of them are right below the handle, and if you want to press them while being directly above the pack, you won’t see where they are. You’ll have to guess or use your finger memory. After a while, you get used to it, but still, I can’t figure out why it’s been designed this way, At least, just putting stickers on the side or top of the handle to know what button is where would have helped. 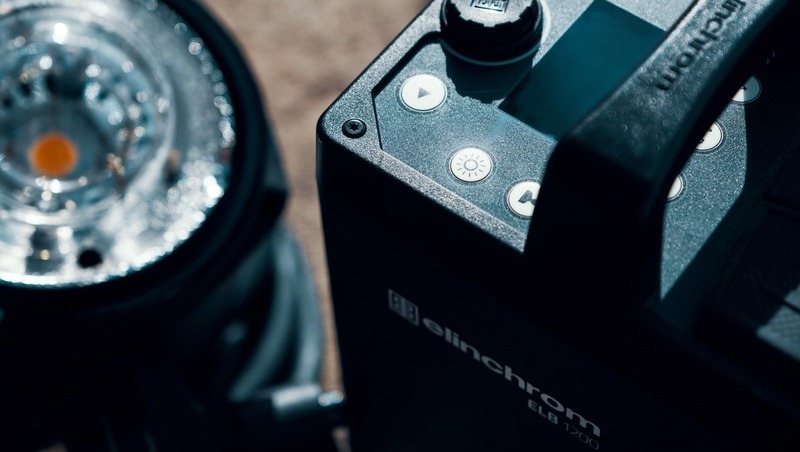 I also wish Elinchrom had implemented a way to check the battery status while it is on the ELB 1200 pack without having to switch on the unit. 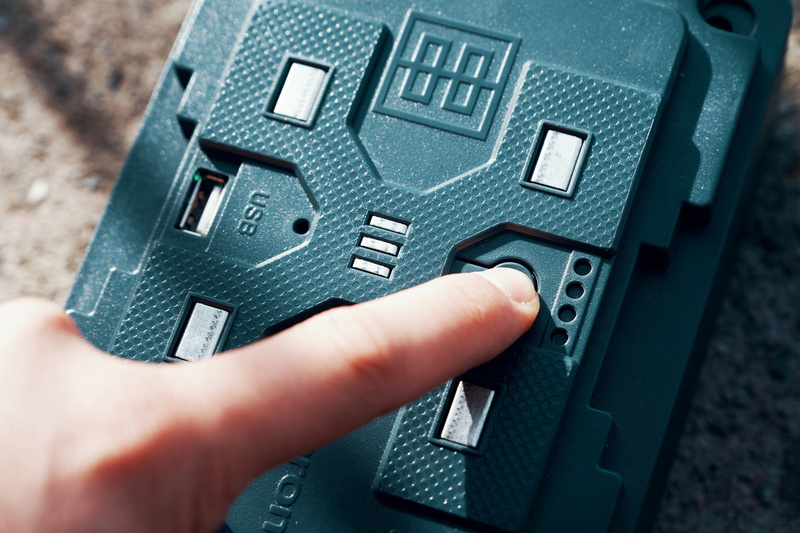 The only way to check your battery charge level is either to switch on the unit or to take the battery out. One thing that is fantastic regarding the battery, though, is that you can plug in your USB devices and charge them with it! If you have a Sony or Fuji camera, you could even recharge your camera with it. The ELB 1200 is a quite recent unit but doesn’t come with TTL and still relies on the more traditional flash design Elinchrom is known for. It’s great, because the shortest flash duration isn’t at minimum power like is the case with so many other flashes, such as recent Profotos, making the ELB 1200 more appealing for outdoor action photographers. However, it won’t work at all for those who wanted HSS (flash pulsing to get over flash sync speed) instead of HS, and it won't be the best choice for those who need a very short flash duration at the lowest power settings possible. Still, while HSS doesn’t work with the ELB 1200, it does work with Hi-Sync, which is best for photographers who shoot outdoors and need the most power output possible. HS doesn’t lose as much power as HSS does. Aside from HS, the ELB 1200 also offers strobo, sequence, and delayed modes. These are great to have, and I’m sure those who need them will use them extensively, while others probably won’t ever touch these modes. The strobo is a mode in which the flash will fire a burst of flashes at a given frequency over the course of the time period of your choice. I wish the frequency could be the number of pops during that period of time rather than a frequency in hertz (Hz). I doubt that everyone will know how to set it up using hertz without the user guide. The sequence mode is exciting for those who want to trigger multiple flashes one after the other. For example, a sports photographer who needs to fire the flash faster than the unit can recycle could set up two packs in a sequence so that the first one can recycle while the other is being triggered, essentially cutting the recycling time in half. Up to twenty flashes can be put in a sequence. The last mode will let you set a delay before the strobe is triggered. It can have its uses if you can’t set up rear curtain sync or for some creative purposes. The modeling lamp — no matter what head — is fantastic, so much so that you can use it as a video light. The only downside is that you cannot charge your pack while using it. So, if you plan on using the system to light your video sets, be sure to buy multiple batteries. The default one charges very quickly, and it should go from empty to fully charged before the one you are using runs out of juice. 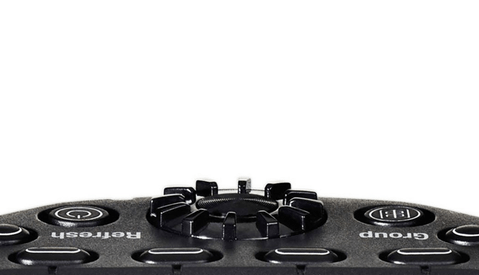 The heads also come with a switch to turn the fan on or off, so that if you are recording audio while using the head to light your video sets, you won’t be bothered by the fan noise. I wish they had designed a way to plug the head directly to the battery or a wall outlet so that it could be used without the pack. Because, unless you need a lot of power, this is more than enough as a continuous light for most indoor uses, but I don’t always want to lug the ELB 1200 pack with me just for continuous lighting. Broncolor did this with the Move L, so there is probably some hope that Elinchrom will follow and do the same. As I’m a beauty and portrait photographer, I’ve been using it mostly in the studio, but that’s not to say that I haven’t put the unit to the test. Because, as mentioned at the beginning of the review, the ELB 1200 was designed with sport and action photography in mind, but it actually turns out to be an excellent all-around unit. In studio, the unit is fantastic. 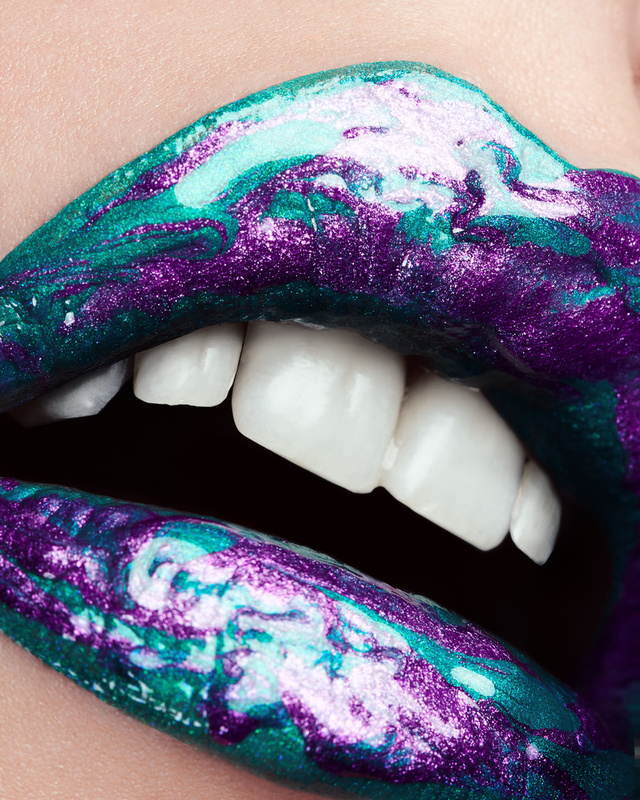 The highest power setting was beneficial for me when shooting macro beauty with a very closed diaphragm. With a power range of 8.5 f-stops, the pack is just half a stop away from the power range of the Broncolor Move L. While using the ELB 1200, there were times I wish I could have gone lower than the lowest setting. HS can be used to dodge that problem, but when shooting in a studio environment, I prefer to stay away from HS to keep my colors and light consistent across the frame. But the power limitation in the lower range is, unfortunately, an issue across the whole range of Elinchrom products, as it is currently limited by their power scale that is similar on all their units, meaning an ELB 1200 set to 0.1 will give the same power output as an ELB 500 TTL or D-Lite set to 0.1. It's great when using a mixed strobe setup, but it's unfortunate that now it's impossible to lower the setting below 0.1 with any Elinchrom! Let's hope the scale will be changed in the future, either by a firmware upgrade or by a new scale for future products. When using it indoor, I was a bit disappointed that I couldn’t use it while plugged into a wall outlet. All Elinchrom battery packs I’ve owned so far have had this feature, except for the ELB 1200! Another thing that I don’t like at all is the fixed ratio between the two outputs. You can set it to 1:1 or 1:2, but there is no asymmetry mode. At 1,200 Ws, it would have been such a great unit to use if the two outputs could be set freely and independently. With a very small aperture, the power of the ELB 1200 comes in handy. Its power and color consistency are also big advantages for precise work. 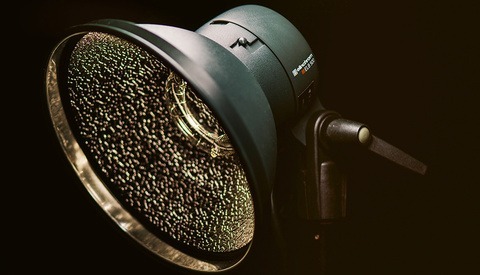 Aside from the maximum power, what makes the ELB 1200 great in studio is the power output consistency from shot to shot. According to manufacturers' specs, it rivals the Broncolor Scoro 3200 S (+/-0.03 percent), while the Move L ,like the ELC HD, is still excellent but a bit less stable (+/-1 percent). In other words, the light output consistency of the ELB 1200 should be on par with some of the best studio packs available! In the real world, most of us won't see a difference from shot to shot either with the ELB 1200 or the Move L. I personally couldn't tell you if the announced specs are exactly right. I tried to fire the flash 10 times at 4 different power settings, and my flash meter gave me consistent readings, with one or two flashes that shifted by 1/10th of a stop for each power setting. But with a meter that gives me a reading in 1/10th stops, it's difficult to be precise and say if it was really a 1/10th stop difference or just a rounded up reading. When working on location, outside, the ELB 1200 is fantastic. It has a ton of power to overpower the sun even without using HS. It’s also very solid, comes with extra protection, and the handle on the top makes it easy to transport it anywhere. The choice between the three heads is also excellent. You decide on what settings you shoot most in and pick the head that best suits your needs. At least, that's the ideal scenario when you have the money to pick different heads. In all honesty, when working outdoors, being able to afford one Action and one HS head is best. It gives you the most freedom possible. If you are on a budget and don’t shoot a lot of fast-moving subjects, the Pro is the better choice. 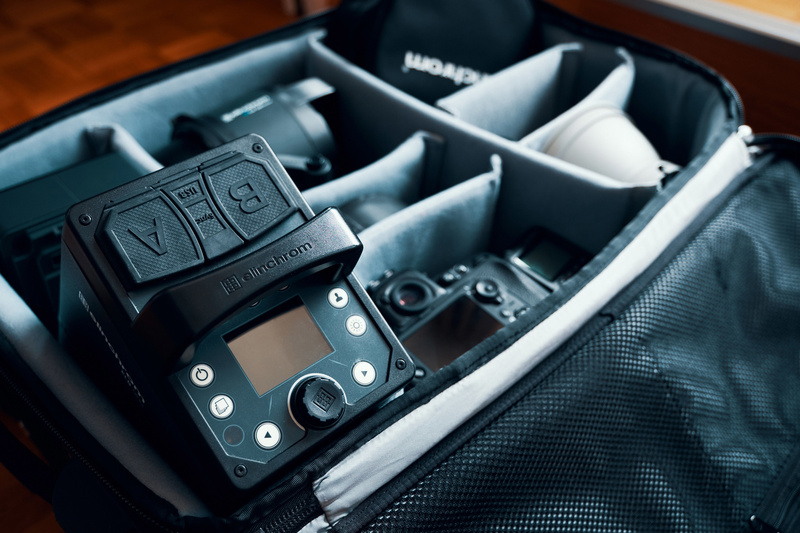 A full kit including the ELB 1200 pack, one battery, one head of your choice, a trolley, a snappy, and an umbrella is priced at $3,699, while the pack alone is $3,049 and a head costs $899. If you want to use the HS mode, add $249.95 to your total for a Skyport Plus HS or Transmitter Pro. The price of the kit is roughly half of the equivalent Broncolor Move 1200 L kit. That doesn’t mean the Elinchrom is a better value for the money though. After having tried the two, I believe they are very different units for very different photographers. The Move L offers full asymmetry between the two heads, which is fantastic for those of us who like to work with multiple heads on a single pack. The Broncolor system is easier to understand, in the sense that you won’t need to choose a head among three, but just pick the one that works with the Move L pack. 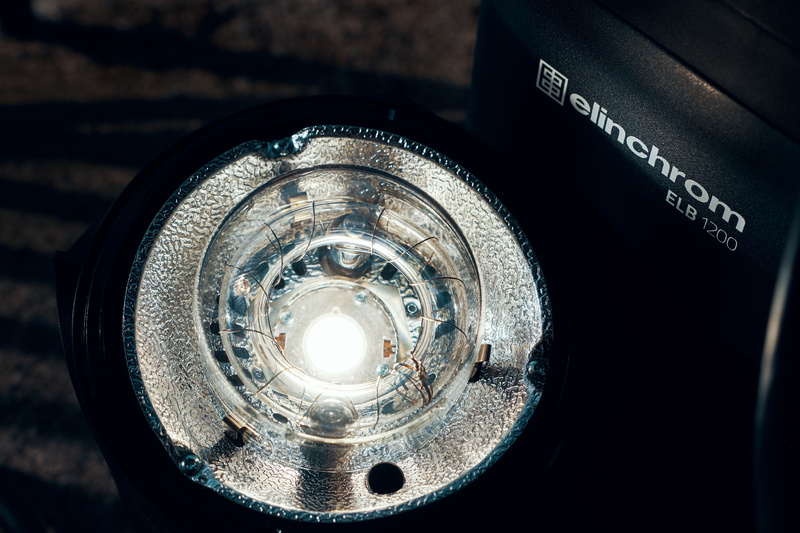 That single light available for the system can yield a shorter flash duration than the Action head of the ELB 1200 while still offering HS sync, but for a smaller power range than that of the Elinchrom. The recycling time is also shorter on the Broncolor pack (1.9 seconds versus 3 seconds at full power); however, the ELB 1200 battery will give you more total flashes per charge and can be put in fast recycling mode to speed it up. To me, the Move L is more of a studio pack that was designed to be used on location as well thanks to its battery, while the Elinchrom was designed as a powerful battery flash for action and sports photographers but still with fantastic specs so it can be used as studio pack. Overall, the ELB 1200 is a fantastic flash for its price. As I said before, it can be compared to the Broncolor Move L, but the two are different options for different photographers. I’ve used both, enjoyed both, and would be hard-pressed to pick the best one. However, the Move L is six years old and still is relevant next to a unit that is about to celebrate its first year. It’s a good thing for Broncolor, a little less so for Elinchrom. It’s becoming difficult to innovate in the flash industry, but comparing two units that are five years apart and seeing that the gap is smaller than one may think is a bit underwhelming. Nonetheless, for Elinchrom owners, it’s an excellent replacement for the Ranger RX and a great complement to the ELB 400 or ELB 500 TTL. Team exposed flash tube forever! 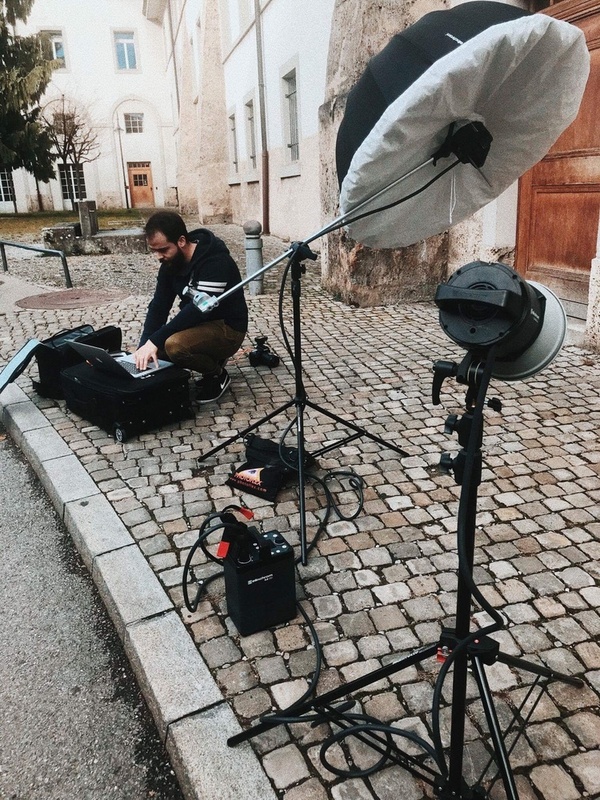 "I was told by Elinchrom that it is now mandatory to put a protection around the tube/LED, and thus they don’t have a choice but to use either this kind of glass dome or a recessed tube like Profoto did with their recent compact and battery-powered units." This is something that I found weird with the ELB 500. Why didn't they thoroughly re-design the head to include a protective dome with these ? Is it because they could circumvent the regulation by presenting the ELB head with its default 13cm reflector and plastic cover ? I just emailed Elinchrom about it, and apparently, there was a miscommunication regarding the glass dome on the ELB 1200. They told me the following "only for flash units with Halogen lamps a glass dome is mandatory. For the ELB 1200, 400, 500 they can be also used without the glass dome, no security issues here." Thanks for the reply. That's interesting. I had heard about these regulations but I thought that they concerned the flash tube (risk of explosion), not the halogen lamp. I assume that it's the same set of regulations that concern halogen home light bulbs ? I initially understood it like you, that it was in case the tube would explode – even though it would actually implode from what I was told. But I guess it's probably for similar reasons, yes. In another time I used to shoot allot of swimsuit and glam stuff on location (so beaches, nature, water , etc) and also did a fair amount of catlogue work. I used to use the Elinchrom BRX 500 Series- which is now being sold with 2 heads, soft boxes , and an LP 800X battery pack that can be used on location (and also I think the flashes can be plugged into a wall if I am not mistaken ). 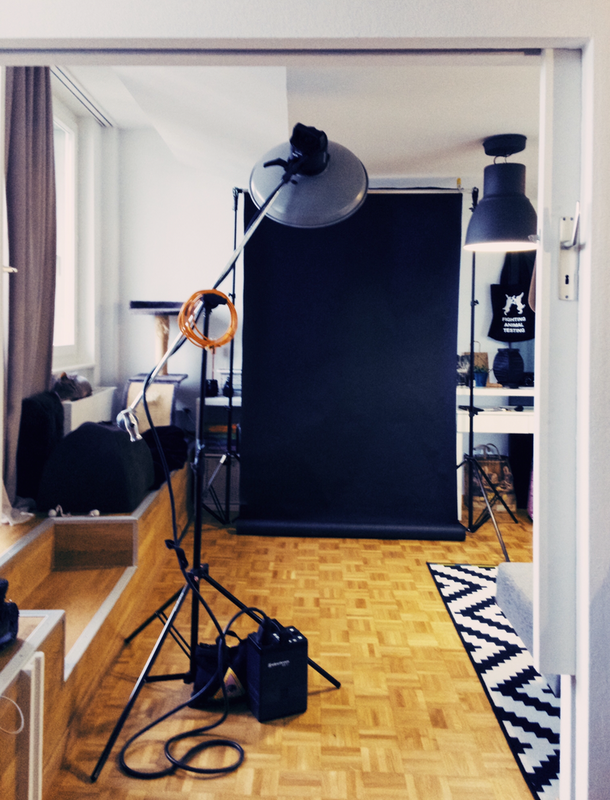 Which you think is the better system for both indoor studio work and on location? Well aware they are two very different models but does a battery pack included with studio flashes tough enough to go on location a better alternative or is there something I am missing? The BRX isn't as weather sealed as the ELB 1200. The fans of the ELB heads can be disabled so you avoid pulling some dust or sand inside the heads. The light output and color consistency are also better on the ELB 1200 (at least with the pro head) than with the BRX. The power ranger of the ELB 1200 is greater – goes higher and lower than any BRX. The BRX is great when on a budget, but I'd almost be tempted to say that if budget is the issue, the D-Lite range is then a better choice. If you want the best option from Elinchrom to shoot in studio and on location, then the ELB 1200 and the ELB 500 (depending on the power you need) are your best options.